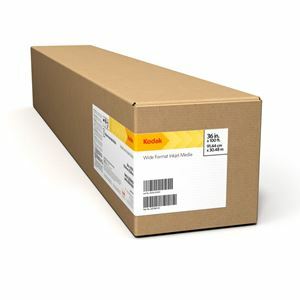 KODAK Canvas, Matte / 16 Mil / Solvent is the newest generation in canvas for solvent, low-solvent and UV-curable inkjet print technologies that gives print shops and fine-art reproduction companies a high-quality, economical solution for photographic and fine-art reproductions. Ideal for production décor, high-end point-of-purchase and banner applications, the poly/cotton blend canvas with a traditional 2-over-1 weave has an acid-free base for long-lasting images indoors. It can also be used for short-term outdoor applications.